There are significant differences among different types of silver-based dressings, not only in the way they employ silver, but in the types and amount of silver compounds used. *Source: Thomas, S. and P. McCubbin (2003). "An in vitro analysis of the antimicrobial properties of 10 silver-containing dressings." J Wound Care 12(8): 305-308. Silverlon uses a unique silver plating process that employs more pure metallic silver in the dressing than any other silver-based dressing. Typically up to 100 times more than the leading impregnated dressings and 5 times more than crystalline silver dressings. The high silver content provides a large reservoir of deliverable silver ions within the dressing, when activated and applied to the wound. Silver is not antimicrobial unless activated. Silverlon dressings are activated prior to application and have an immediate antimicrobial effect. Silver ions kill pathogens by at least three mechanisms. First, the ion binds to a receptor on the cell wall, preventing cellular respiration. Second, in the same manner, it prevents the cell from taking in nutrients. And third, the ion penetrates the cell wall, disrupting the DNA and preventing replication. While Silverlon dressings generate a large reservoir of deliverable silver ions when activated, they will never stain the wound by dumping metallic silver onto the patient. Not all silver dressings are created equal. 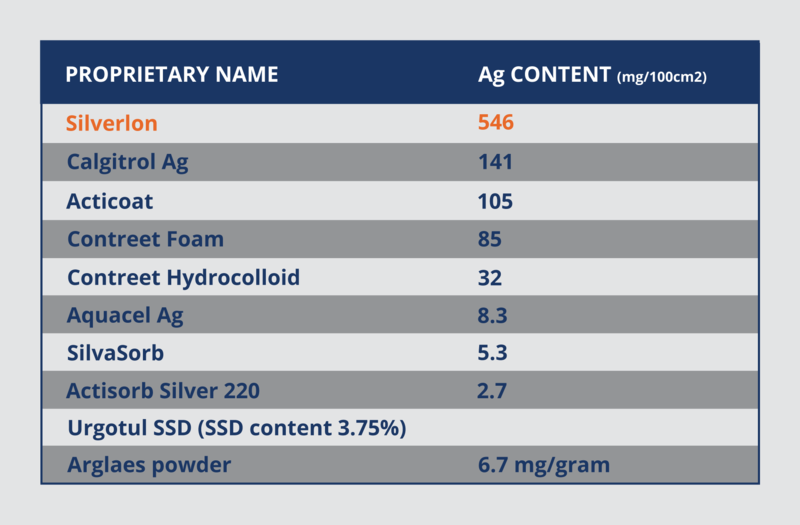 Silverlon delivers more metallic silver for optimal results.